Richard Lydecker, a UB swimming and diving alum and attorney, is representing Towers and five other swimmers pro bono. Members of UB’s swimming and diving program held a sit-in outside President Satish Tripathi’s office Monday, with the goal of having a meeting with Tripathi. The sit-in began around 12:40 p.m. and student-athletes did homework and played video games while they waited for someone from administration to come out of Tripathi’s office. 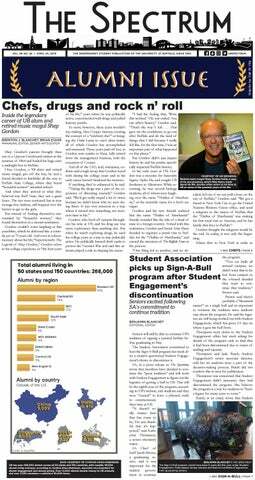 A UB alumnus is threatening to sue UB over its April decision to cut four sports teams, particularly UB swimming, to which he has donated $15,000 since 2015. Richard Lydecker, a successful civil litigator with offices in Miami, New York and Tampa, is outraged that UB solicited his pledge to give up to $50,000 to the men’s swim team, but then cut the team without warning. The first time Dave Hahn stood at the summit of Mount Everest, he did not experience a feeling of elation. Hahn only spent 10 minutes at the top before his focus shifted to the next task – finding a way back down. “It wasn’t this moment for celebrating,” Hahn said. Evan Tirsun wanted to use the summer between his junior and senior year to gain hands-on business experience. When a few financial internships fell through at the last minute, he worried he had lost that opportunity – until his girlfriend took him to a thrift shop for the first time. John Kling, a former UB offensive linemen, will get a second chance at making his NFL dream come true as the Washington Redskins announced they were signing him to a free agent contract. When Joey Bada$$ released the lead single to his new albumon Inauguration Day earlier this year, it was obvious what direction he would take on his sophomore album. Four UB Athletics teams walked into a meeting Monday morning silent and confused. What is the cost of speaking your mind in the NFL? In the case of Colin Kaepernick, the answer is shaping up to be millions of dollars. Four years ago, it was unthinkable to imagine that not a single NFL team would want Kaepernick. Eight years ago, an unknown linebacker from Florida who played only one year of high school football received just one offer to play Division-I FBS from UB. That player, Khalil Mack, took to the game quickly. He went on to become an All-American, the NCAA’s all-time leader in forced fumbles, and most recently, the NFL’s defensive player of the year. This fall, there will be another Mack in UB’s linebacking corps.